Ask nearly anyone who has served in the military about their chaplain, and you will almost always hear a positive story. Since before the founding of our nation chaplains have served alongside those who have sought to defend our country and the values we represent. Chaplains are agents of peace, always present in the most trying of times — available to all, no matter the circumstance or the person. On Feb. 3, 1943, one of the greatest examples of self-sacrifice, human love and trust in God took place in the bitterly cold waters of the North Atlantic. The U.S. Army transport ship Dorchester, with over 900 people on board, was 150 miles from its destination in Greenland when a U-boat spotted the ship and fired upon it. One torpedo struck the ship below the waterline, inflicting a mortal blow. Less than 20 minutes later the Dorchester was lost. In all, 230 crew members were rescued. The remainder were lost at sea. Four chaplains had embarked on the Dorchester — a Methodist minister, a Reform rabbi, a Roman Catholic priest and a Reformed Church in America minister. According to personal accounts of those who survived the tragedy, the four chaplains helped many to safety, gave away their own life jackets and were seen and heard standing together with linked arms, offering prayers as the ship slipped beneath the waves. 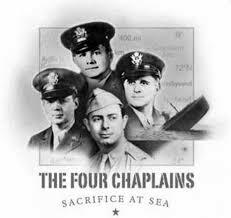 These four chaplains are part of our history. Their dedication to others, even as it compelled their self-sacrifice, continues to help form the identity of every chaplain who serves in our nation’s military today. The PC(USA) has over 125 men and women currently serving as military chaplains. Their ministry is both at home and abroad, coming alongside service members and their families wherever they serve to bring peace during joy or sorrow, in safety and in danger, and in all stages of life. In Psalm 107, the “Sailor’s Psalm,” the Psalmist tells us in verse 28: “Then they cried to the Lord in their trouble, and he brought them out from their distress.” Please thank our Lord for calling chaplains to bring courage and peace to all who serve. and he brought them out from their distress. Lord, today men and women who have volunteered to serve in the defense of our nation are deployed around your globe. We ask you to watch over them and to give them wisdom and strength to pursue freedom and justice. And be with their chaplains, encouraging and enabling them with your words of encouragement, comfort and peace. Amen.